©1998 John Hultgren, Louisville, Kentucky Photo may not be reproduced, copied, archived, or retransmitted without permission. Alongside Route 111 near Grange City, Kentucky N 38° 15.298' W 83° 39.201' Located in Fleming County, the Hillsboro Covered Bridge carried KY 111 across Fox Creek south of Hillsboro. 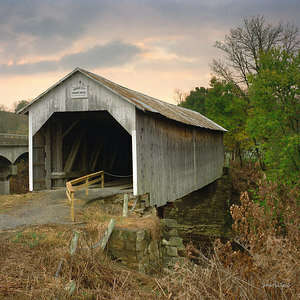 It was built between 1865 and 1870 and is an 86-foot long double post and brace design. Hasselblad 503CX camera with Kodak VC 160 film This photograph was awarded first place in the 2004 Kentucky State Fair Fine Arts Division (Kentucky Name Place Photography Class) and has appeared on the cover of the Kentucky Association of Counties County Line magazine, July - August 2002 issue. ©1999 John Hultgren, Louisville, Kentucky Photo may not be reproduced, copied, archived, or retransmitted without permission. On south side of SR 1029 just south of Swart Road, alongside Johnson Creek, near Burika, Kentucky N 38° 28.938' W 83° 58.706' Hasselblad 503CX camera with Kodak VC 160 film This photograph was awarded fourth place in the 2006 Kentucky State Fair Fine Arts Division (Scenic Photography Class). Our framed limited edition prints include a Nielsen Profile 15 155 Florentine Amber metal frame. The outer mat is Crescent Select Bambi 9589; the inner mat is Crescent Select Spice 9836. (Colors may not be accurately depicted on your computer monitor.) Prints are backed by a 3/16" acid free foamcore. Framed prints sold at art shows include museum quality UV filtering Cyro Acrylite OP-3. Of course, you can order just the print and select your own frame and mat from your favorite local fine art frame supplier. ©2000 John Hultgren, Louisville, Kentucky Photo may not be reproduced, copied, archived, or retransmitted without permission. Alongside Roaring Fork Motor Nature Trail, Great Smoky Mountains National Park, outside of Gatlinburg, Tennessee. N 35° 42.143' W 83° 28.221' The remnants of an old mill located along a mountain stream in the Great Smoky Mountains National Park. 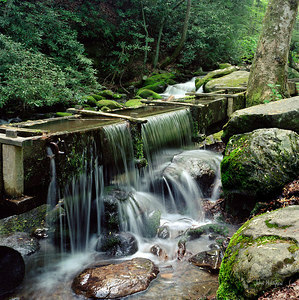 Photographed near the Roaring Fork Nature Trail outside of Gatlinburg, Tennessee. Straddling the border between North Carolina and Tennessee, the Great Smoky Mountains National Park is one of the largest protected areas in the Eastern United States and is world renowned for the diversity of its plants and animal life, the beauty of its ancient mountains, the quality of its remnants of Southern Appalachian Mountain culture, and the depth and integrity of its wilderness sanctuary. Hasselblad 503CX camera with Kodak VC 160 film 05/03/2000 Mid morning. 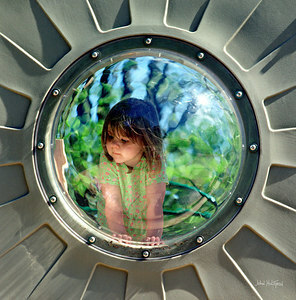 This photograph was awarded First Place in the 2011 Kentucky State Fair Fine Arts Professional Photography Division. ©2001 John Hultgren, Louisville, Kentucky Photo may not be reproduced, copied, archived, or retransmitted without permission. 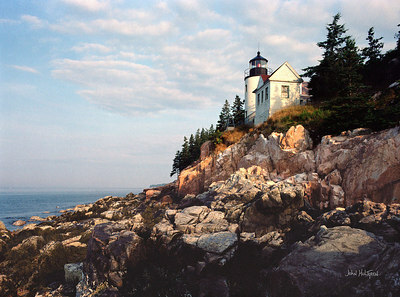 Bass Harbor, Mount Desert Island, Maine N 44° 13.309' W 68° 20.159' Bass Harbor Head Light on Mount Desert Island near Arcadia National Park, Maine. The station was established and built in 1858 and automated in 1974. The station is a brick construction and the height of the tower is 32 feet (focal plane 56 feet) and is attached to a wood-frame keeper's house. It has served to warn mariners of the Bass Harbor Bay at the entrance to Bass Harbor and to mark the entrance to Blue Hill Bay. Hasselblad 503CX camera with Kodak VC 160 film 08/2001 Sunrise This photograph was awarded Honorable Mention in the 2010 Kentucky State Fair Fine Arts Division. ©2001 John Hultgren, Louisville, Kentucky Photo may not be reproduced, copied, archived, or retransmitted without permission. 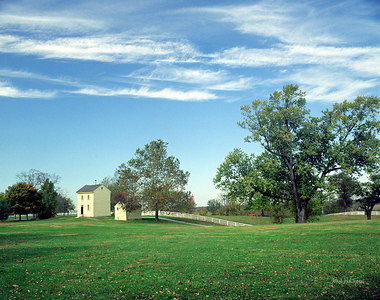 Shaker Village of Pleasant Hill, Kentucky N 37° 49.128' W 84° 44.310' The Shaker Village of Pleasant Hill, Kentucky, is the largest historic community of its kind in America and a National Historic Landmark. The Pleasant Hill Shakers came principally from central Kentucky and were first or second generation descendants of the pioneers who settled the Kentucky River frontier in the eighteenth century. They were industrious farmers accustomed to overcoming hardships by using their own canny ingenuity and determination, a self-sufficiency that stood them well in establishing a utopia in the wilderness. Hasselblad 503CX camera with Kodak VC 160 film 10/26/2001 Afternoon This photograph was awarded Honorable Mention in the 2007 Kentucky State Fair Fine Arts Division (Kentucky Named Place Photography Class). ©2002 John Hultgren, Louisville, Kentucky Photo may not be reproduced, copied, archived, or retransmitted without permission. Playground, Cherokee Park, Louisville, Kentucky N 38° 14.334' W 85° 42.217' Hasselblad 503CX camera with Kodak VC 160 film 04/28/2002 Afternoon This photograph was awarded honorable mention in the 2004 Kentucky State Fair Fine Arts Division (Human Interest Photography Class) and was published on a Jones Soda Company soda bottle label in 2005. ©2003 John Hultgren, Louisville, Kentucky Photo may not be reproduced, copied, archived, or retransmitted without permission. Fort Christian, Charlotte Amalie, St. Thomas, U.S. Virgin Islands N 18° 20.44 W 64° 55.83 A door latch photographed at Fort Christian, Charlotte Amalie, on St. Thomas in the U.S. Virgin Islands. Resting over Charlotte Amalie Harbor since 1672, Fort Christian is the oldest standing structure in the Virgin Islands. Now a U.S. National Landmark, this brick fortress protected the town from pirates and European armadas. This fort has served as St. Thomas' first government house, a church, and a community government. Today it is home to the Virgin Islands Museum. Nikon D100, 200 ASA, 50 mm focal length, 1/125 sec, f/5, 07/16/2003 10:08 This photograph was awarded Honorable Mention in the 2007 Kentucky State Fair Fine Arts Division (Unclassified Photography Class). Our framed limited edition prints include a Nielsen Colorware Profile 15 050 Black metal frame. The outer mat is Crescent Select Milk Shake 9588; the inner mat is Crescent Select Valentine 9576. (Colors may not be accurately depicted on your computer monitor.) Prints are backed by a 3/16" acid free foamcore. Framed prints sold at art shows include museum quality UV filtering Cyro Acrylite OP-3. Of course, you can order just the print and select your own frame and mat from your favorite local fine art frame supplier. ©2004 John Hultgren, Louisville, Kentucky Photo may not be reproduced, copied, archived, or retransmitted without permission. 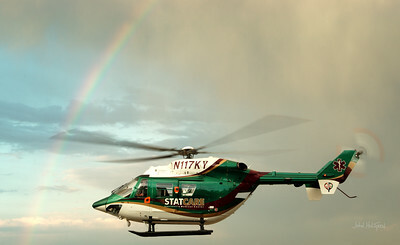 Louisville Medical Center STATCARE makes an air medical flight as a storm clears, in front of a rainbow. N 38° 13.488' W 85° 40.065' Begun in 1982 as Jewish Hospiital SKYCARE, the first civilian air medical program in Kentucky, SKYCARE merged with University of Louisville Hospital STAT Flight in 1998 to become STATCARE. STATCARE was acquired in 2006 by C.J. Systems Aviation and purchased in 2007 by Air Methods Corporation. Nikon D100, 200 ASA, 38.0 mm focal length, 1/100 sec, f/7.1 04/26/2004 19:49 EST. 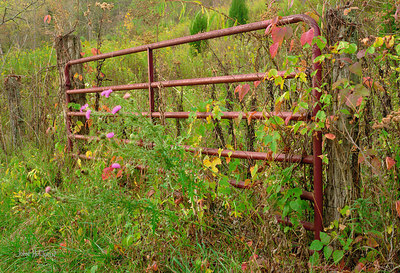 This photograph was awarded Third Place in the 2013 Kentucky State Fair Fine Arts Color Accomplished Photography Division, Kentucky Transportation Theme. ©2005 John Hultgren, Louisville, Kentucky Photo may not be reproduced, copied, archived, or retransmitted without permission. 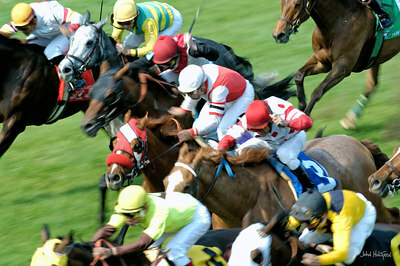 Jockeys and horses take off on the day of the Kentucky Derby. Churchill Downs, Louisville, Kentucky. N 38° 12.227' W 85° 46.202' Churchill Downs, which officially opened in 1875, is a thoroughbred racetrack most famous for hosting the Kentucky Derby. The track is named for John and Henry Churchill, who leased 80 acres of land to their nephew, Colonel M. Lewis Clark (grandson of explorer William Clark). Today, Churchill Downs covers 147 acres and has seating capacity for 51,000 (although crowds at the Derby can reach over 140,000). This photograph was taken on the inside turf track. Nikon D100, 200 ASA, 200 mm focal length, 1/100 sec, f/10 05/07/2005 16:54 EDT This photograph was awarded honorable mention in the 2005 Indianapolis Star Photo Contest. Our framed limited edition prints include a Nielsen Profile 25 004 Frosted Gold metal frame. The outer mat is Crescent Select Peach Fuzz 9517; the inner mat is Crescent RagMat Crimson 1625. (Colors may not be accurately depicted on your computer monitor.) Prints are backed by a 3/16" acid free foamcore. Framed prints sold at art shows include museum quality UV filtering Cyro Acrylite OP-3. Of course, you can order just the print and select your own frame and mat from your favorite local fine art frame supplier. ©2007 John Hultgren, Louisville, Kentucky Photo may not be reproduced, copied, archived, or retransmitted without permission. West Glacier Flathead County, Glacier National Park, MT. 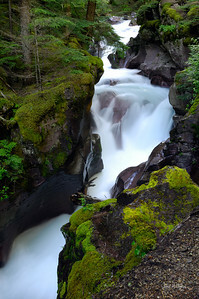 N 48° 40.583' W 113° 48.779' Avalanche Creek squeezes through a narrow gorge below Avalanche Lake, near the Trail of the Cedars east of Lake McDonald Lodge. Located in Montana, Glacier National Park was named for the glaciers that carved, sculpted, and formed this spectacular landscape millions of years ago. Nikon D2X, 100 ASA, 28 mm focal length, 1.3 sec, f/14 06/15/2007 9:06 MDT (2006-06-15 15:06 UTC) This photograph was awarded Honorable Mention in the 2008 Kentucky State Fair Fine Arts Division. Our framed limited edition prints include a Nielsen Profile 25 002 Frosted Silver metal frame. The outer mat is Crescent Select Meteorite 9630; the inner mat is Crescent Select Forest Green 9820. (Colors may not be accurately depicted on your computer monitor.) Prints are backed by a 3/16" acid free foamcore. Framed prints sold at art shows include museum quality UV filtering Cyro Acrylite OP-3. Of course, you can order just the print and select your own frame and mat from your favorite local fine art frame supplier. 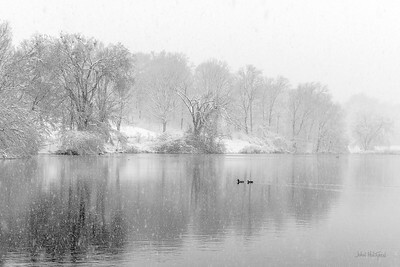 Spring Snowstorm at Willow Pond (Monochrome). ©2018 John Hultgren, Louisville, Kentucky. Photo may not be reproduced, copied, archived, or retransmitted without permission. Cherokee Park, Louisville (Jefferson County) KY . N38° 14.688' W85° 42.037' Nikon D810, ISO 400, 70 mm focal length, 1/125 sec, f/16, 03/21/2018 09:39 EDT (2018-03-21 13:39 UTC). This photograph was awarded First Place in the 2018 Kentucky State Fair Fine Arts Accomplished Photographer Division. © 1974-2019 John Hultgren Photography, Louisville, Kentucky, USA. Photos may not be reproduced, copied, archived, or retransmitted without permission. Photo may not be reproduced, copied, archived, or retransmitted without permission. 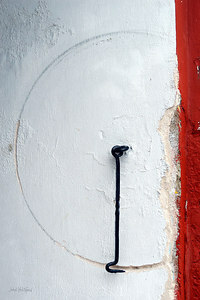 A door latch photographed at Fort Christian, Charlotte Amalie, on St. Thomas in the U.S. Virgin Islands. Resting over Charlotte Amalie Harbor since 1672, Fort Christian is the oldest standing structure in the Virgin Islands. Now a U.S. National Landmark, this brick fortress protected the town from pirates and European armadas. This fort has served as St. Thomas' first government house, a church, and a community government. Today it is home to the Virgin Islands Museum. This photograph was awarded Honorable Mention in the 2007 Kentucky State Fair Fine Arts Division (Unclassified Photography Class). Our framed limited edition prints include a Nielsen Colorware Profile 15 050 Black metal frame. The outer mat is Crescent Select Milk Shake 9588; the inner mat is Crescent Select Valentine 9576. (Colors may not be accurately depicted on your computer monitor.) Prints are backed by a 3/16" acid free foamcore. Framed prints sold at art shows include museum quality UV filtering Cyro Acrylite OP-3. Of course, you can order just the print and select your own frame and mat from your favorite local fine art frame supplier.